The city of Sandpoint is inviting artists to apply for the Silver Box Project, an art-on-loan program and competition. Three sculptures will be selected by jury process for public display on a one-year loan. 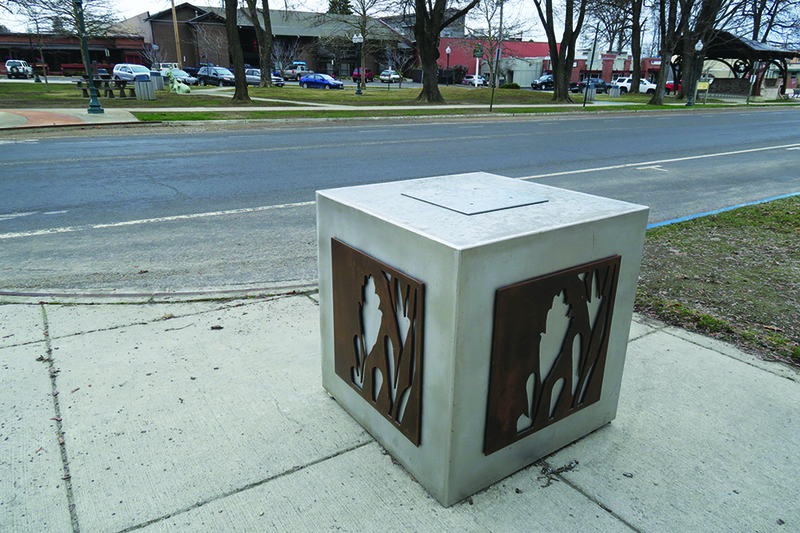 One of the “Silver Boxes” on Oak St. and Fourth Ave. Photo by Ben Olson. The artwork will be mounted on stainless steel bases located in downtown Sandpoint. The sculptures will be featured at various downtown community events and will be promoted through various media. Selected artwork/artists will receive a $500 honorarium and will be entered into a competition for up to $350 in cash prize awards. 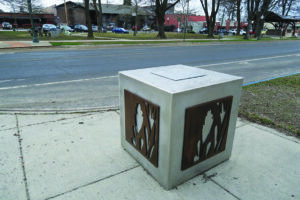 The “Silver Boxes” have been installed at the corners of Church Street and Fourth Avenue, Oak Street and Fourth Avenue and Oak Street and Fifth Avenue. Developed by the Sandpoint Arts Commission and approved by the Sandpoint City Council in April 2018, the Silver Box Project will feature selected works of art that will rotate annually. For each round of featured art, the community will be invited to vote on the selected works for the “People’s Choice Award” which will include a cash prizes to the winning artists. This project is open to all artists residing in the United States. Local and regional artists may be given preference. Artist teams are also eligible to apply, including teams of artists from multiple disciplines. Artists must be 18 years of age. For full details, please visit www.sandpointidaho.gov/silverboxart2019. The deadline to enter is April 12.